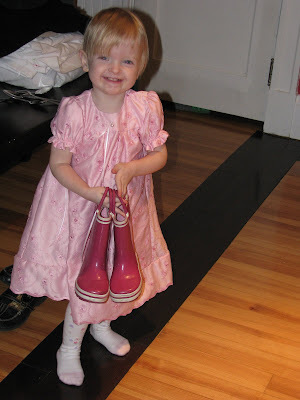 Tessa got a pretty handmade dress from her Grandma U**. 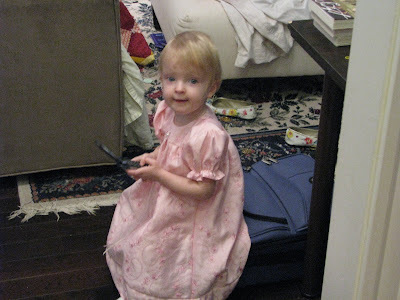 When we pulled it out of the package it was so beautiful that she immediately wanted to put it on her doll. But - she isn't so good at posing for pictures lately. Perhaps you've noticed the number of pictures of her has dropped off. Generally it is because she wants to hold the camera and gets mad when we don't let her. But on Sunday it was because she was just heartbroken at the thought of having her picture taken, I can't even guess why. ohmigosh...she is so ADORABLE when she is upset (i know its probably not nearly so enjoyable with the sound)! She's breakin' my heart with that face! emily and aaron, she is just the cutest little doll. obviously (see above) you get this a lot. but she is. it seems most of my friends have little cuties. i sincerely hope to be a part of the cutie club when it's our turn for babies. 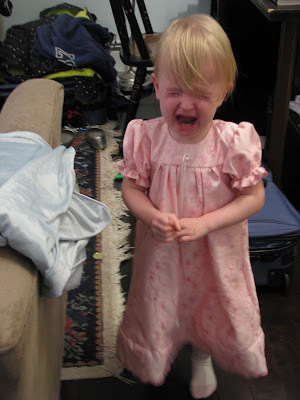 It is so nice to see that other people's children have unexplainable tantrums. That way I can smile at others situations when I can't seem to do much more than grimace in my own. Where are you going to put another baby? ?